I have been pleasantly packing up my little home. Boxes filled and sealed. Destined to be opened in a new strange place. A place that will soon be our home as we begin to fill it with our presence – for that is what home is. The afternoon of March 29th Jeff and I set eyes on this old house for the first time. Like some eternal nurturer always looking for a broken or wounded soul to heal, so Jeff and I tend to be that way with old broken down and tossed aside things on the brink of death. Whether it is an old rusty bucket like the one I just resuscitated last week or a piece of furniture by the curb on trash day. We see not the trash heap it is, but what it once was. What it can still be. We have a vision of “new life” for things others would put in a grave. So it is with this old school house. We came early that day to snoop around before our realtor arrived to unlock the house. We enjoyed guessing the purpose of each out-building and deciding right there how we would use it. We knelt down and prayed in the driveway. Asking the Lord to make a way for us to be the new care takers of this lonely place. Our realtor arrives. She struggles with the lock. The door opens and we look, we see, we imagine…we plan. With Jeff armed with all the capabilities of a construction crew and me (as I’m told) the patience of a saint – we know we could take on this patient. Though dirty, violated in some areas and slightly ill equipped to shelter our family, we knew we could provide the care that was necessary to bring her back to life. I snooped through every door. Like a curious kid wondering where it would lead. One door took me into the bathroom. As my head ducked under old dusty spider webs I turned to look in the mirror. There I found a treasure. 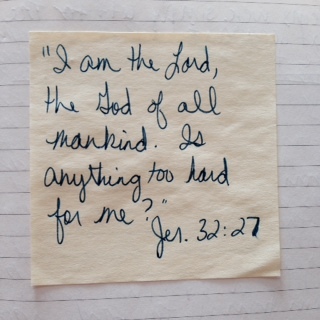 On a yellow post-it note was a bible verse written with a woman’s hand, stuck to the mirror and left behind. I snatched it down. Who was this woman? Our realtor spoke of rumors of divorse. I knew we were looking at a property in a foreclosed status. These walls could tell of hard times for sure. Like scanning a crime scene and trying to put the pieces together I looked for evidence that told their story. A teenage girl once roomed here. They had a moving sale. Unwanted items were simply left for the next occupants. I wondered how they were all getting along now. Had their wounds healed? I will never know. But I do know this – that nothing is too hard for the Lord! The Lord explained to Jeremiah in Jeremiah chapter 32 that He was about to hand the city over to the Babylonians – to destroy it and burn the houses down. His people had ignored Him and turned away from the One True God. They were in trouble and their lives were falling apart. The Lord allowed the Babylonians to come in and destroy it. He intended to show them just what life would be like for them, without Him. And it was a nightmare. But our Good God would not allow that to be the end. I have also turned from God and His tender care. Each time, He never withheld the sure consequences of living in such disregard to His goodness and mercy. 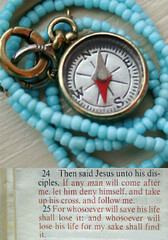 When my life would cease to worship Him he showed me exactly where that would lead – an exile of sorts. But He always welcomed me back when my heart returned to Him. He would not shame me nor allow me to live in the disgrace I deserved. This is the God that Jeff and I worship. He loves to make things new – to breath new life into something on the brink of death. The Lord has done that in our marriage when it was destined for the trash heap. A bond so broken by sin and selfishness that only the Lord could bring us back with a singleness of heart and action…for our good and the good of our children. Nothing is too hard for the Lord! This is so much more than fixing up a house. Anyone can come in and do what Jeff and I are doing- the painting, cleaning and repairs. It would be all for nothing if we didn’t love the Lord. Because He is the one that breathes the breath of life into our souls. It is His presence that makes this broken house a home! Oh Lord, you are so good to us. Thank you for stretching out your arm to us. Restore our hearts. Make them new. Breath life into our homes. Give us the singleness of heart and action that we long for. For our good and the good of our children. -Amen. When have you found something or someone that you thought was beyond repair? Sometimes you see someone so ravaged by selfishness that you think there is no hope for them. Do you find it hard to have compassion and mercy for those in need of the Lord? Take some time and think about what God has made new in your life. What has he rescued you from? It’s one thing to put some screws into an old shaky chair. It’s an entirely different thing all together when you find a broken person. Only God can see into their broken places and apply the healing touch of a creator. The paragraph about your marriage resonates with me. The Lord restored our marriage many years ago, and drew us close to Himself. Nothing is too hard for the Lord! I like this, Bri! Well written. Hey Bri!! I found your website through google. Congrats on the new home!! I thought I had seen a sold sign in your yard recently. Where are you living now? I hope you are all doing well!! Hello, my name is Teri Bowman. Dawn sent me your blog. I read it this morning when I woke. I am “this woman” who wrote the sticky notes. I raised my five children in the Mynard Rd home. Would you like to meet me? I feel compelled to talk to you.